Institute of Chicago, circa 1907 – 1909. 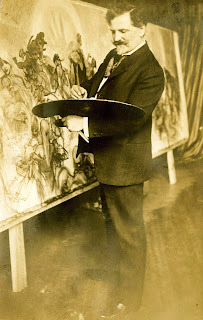 One of the photographs in my grand aunt Detty’s (Benita) scrapbook of memories was of her professor, Alphonse Mucha, whom she regarded highly and considered an early influence on her work. Mucha, a Czech artist, was world renowned for his contributions to the French school of the Art Nouveau movement. After Mucha moved from his native Moravia to Paris, the famous actress Sarah Bernhardt asked him to create a poster of her to promote an 1895 play in which she was starring.Titled Gismonda for her character and the name of the production, the poster attracted critical acclaim for its seminal and unconventional style. Mucha went on to create many more posters and paintings, illustrations, and commercial art in what became known as the Mucha style. I have not been able to find a publication by that name, nor can I determine that such a periodical existed. 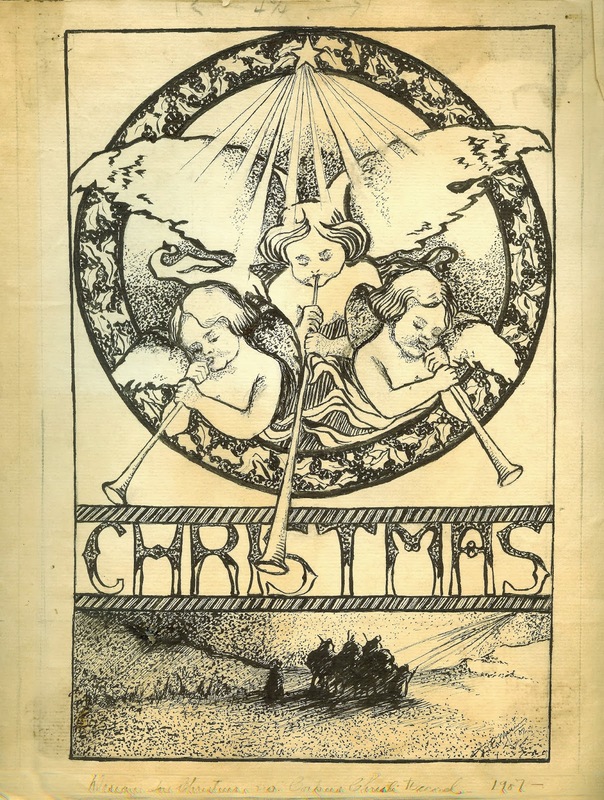 Maybe Aunt Detty wrote the caption at the bottom of the illustration at the time she drew it or years later, when the name of the periodical could have been blurred by memory. I do think, though, that this was a preliminary sketch and that there may have been a color version of it somewhere. Benita McGinnis’ Art Nouveau sketch, in le style Mucha, boasts a decorative halo-like border that was a hallmark of many Mucha posters. Three cherubic angels, illuminated by the Star of Bethlehem, burst through the halo as they blow their horns, heralding the arrival of the Savior as the subtly drawn Magi journey to Bethlehem in the lower quarter of the picture. The caption “CHRISTMAS,” set in its own simple border, ties the two scenes together in a vignette that is solemn yet celebratory. The sketch is signed in the lower right hand corner by B.E. McGinnis and dated 1907. Alphonse Mucha and his family returned to Europe in 1910. Fiercely proud of his Slavic heritage, he spent the rest of his life working on his masterwork project of 20 paintings, each 20 feet high, called The Slav Epic, about the history of the Slav and Czech peoples. In 1939 during the German invasion of Prague, the Gestapo arrested Mucha. He became ill during his interrogation and was released, dying of pneumonia on July 14, 1939. For a more on Alphonse Mucha, click here to view Part One of a documentary on his life.